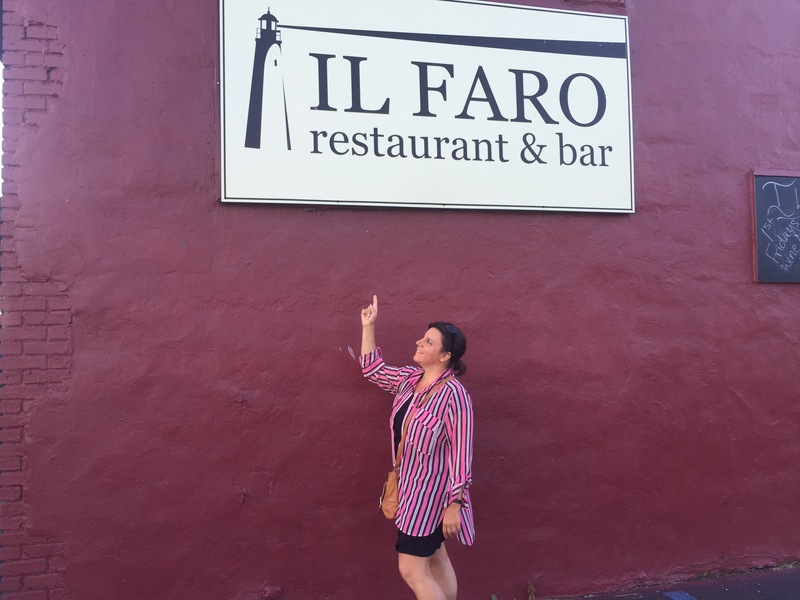 On a warm September night, my husband Tom and I celebrated his birthday with a delicious Italian date night dinner at Il Faro Restaurant & Bar on North Pearl Street. Manhattan transplants Executive Chef and co-owner Christian Lofaro and co-owner and general manager Jessica Lamoreaux invited me to try their fresh made pasta and other temptations. Il Faro is a relative newcomer to the Menands area and will be celebrating the one year anniversary of their opening on October 1st. The interior is very elegant and has a city vibe to it. We started off with the house-made dinner rolls that we dipped in incredible olive oil. We shared an antipasto freddo which came with pickled mushrooms, artichokes, peppers, olives and fresh greens. For his entree Tom settled on the house specialty Murphy, a hearty dish of chicken with hot cherry peppers, potatoes sautéed in white wine sauce. I really wanted to try out their pasta so I had the shrimp scampi, served with homemade linguini. Our server warned me that it would be very garlicky, but garlic never scares me. She was right! The pasta really melts in the mouth. I guess it has been a while since I’ve tasted the real thing. (I told myself then and there that I can never go back to eating the the packaged stuff, but of course, I have since returned to boiling the packaged stuff for the kids, anyway). I was so consumed with my shrimp scampi that I didn’t offer to help Tom with the Murphy chicken. He loved it though! We finished off our dinner with twin cappuccinos. If you are craving a very hearty Italian dinner in an elegant, but friendly setting in the Albany area, I’d definitely recommend Il Faro. My only regret is that I ate too many dinner rolls so I didn’t have room for dessert. Thank you for your hospitality Chef Christian & Jessica!